I think this has been reported before, but I couldn’t find a solution to it. So I’m posting it again. I am trying to add vocab, especially sentences. And I keep running into this exact error. What shall I do? Hmm, this entry does exist so it shouldn’t be asking if you want to add it. What happens if you try to add it without the question mark? Encountered this many times myself. After you’re done just exit the word creation, then again enter the word/sentence and it might give the error again but your entry is saved nonetheless. Basically you have to add it twice; ain’t ideal, but it works. 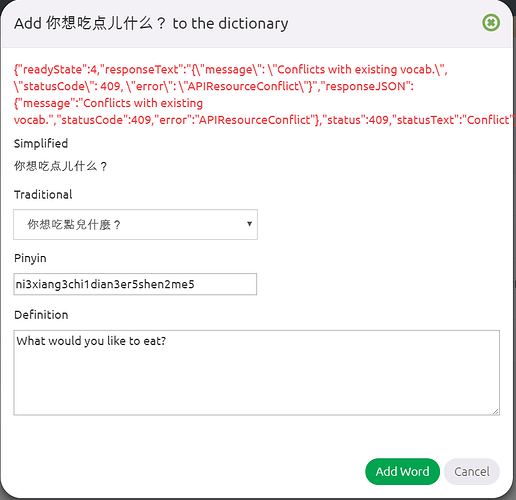 And if you can help it avoid question marks, extra spaces, Latin alphabet letters, symbols and whatever else is not a standard Chinese character.